Through the use of muscle biopsies (slicing out a miniscule piece of muscle and examining it under a microscope), exercise scientists have been able to divide muscles into two distinct types: fast-twitch and slow-twitch. Fast-twitch muscles fire quickly, but also tire quickly; slow-twitch muscles react more slowly, but do not fatigue as easily. Slow-twitch muscles, as the name might suggest, are used most often in aerobic endurance activities whereas fast-twitch muscles are used more for anaerobic speed activities. Along with amazing talent and dedicated training, fast-twitch muscle fibers are one of the reasons why Jamaica’s Usain Bolt has been able to dominate sprinting at the world level and repeatedly crush world records at the 100m and 200m distance for nearly a decade. Could Bolt translate that speed from the shortest Olympic distances to the longest marathon? No. Conversely, top marathoners such as Wilson Kipsang and Meb Keflezighi would be unable to challenge Bolt in his specialty. Most of us fit somewhere in the middle when it comes to fast-twitch versus slow-twitch. From tests in the laboratory, for instance, I know that I possess 55 percent fast-twitch muscles. Other factors notwithstanding, some people are born to be better 5K runners and others to be better marathoners. Training can create some changes, and indeed one subcategory of fast-twitch muscles (fast-twitch 2) can be trained more for endurance. In 1974, Dr. Phil Gollnick of Washington State University and Dr. Bengt Saltin, one of Sweden’s top exercise physiologists, collaborated on a study using a group of cyclists. The scientists were interested in the differences between muscle types. Gollnick and Saltin took muscle biopsies of the cyclists as they exercised and discovered that between 60 and 90 minutes, most of the glycogen stored in the cyclists’ slow-twitch muscles had become depleted. This is important. How well fast-twitch and slow-twitch muscles perform depends partly on how much fuel is available during exercise. Both muscle types burn fuel to function well. Glycogen is the most efficient form of fuel for energy. Glycogen is a substance similar to sugar that is most easily stored in the muscles when you consume carbohydrates. Fats and proteins also can be converted into energy, though less efficiently. 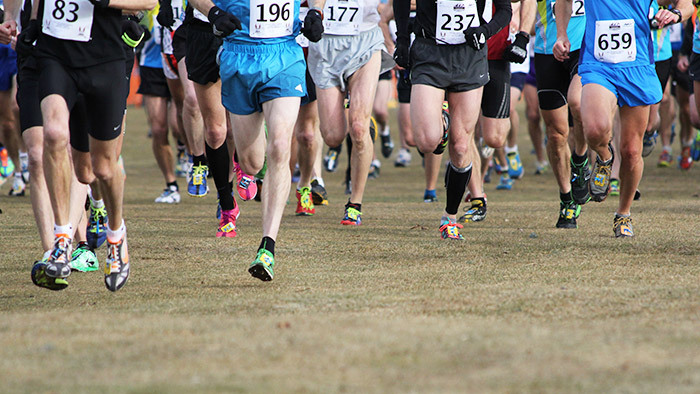 When glycogen becomes depleted, performance results diminish, even in short-distance races such as the 5K. Glycogen depletion is one reason why some marathoners “hit the wall” 20 miles into their 26-mile races. But with glycogen depleted from the slow- twitch muscles, the cyclists’ bodies began to recruit the fast-twitch muscles for their supplies of additional glycogen. As a result, Dr. Gollnick and Dr. Saltin discovered, the body “trained” these fast-twitch muscles, which were thus dubbed fast-twitch 2 fibers. A quick take on this research tell us that this training of fast-twitch 2 muscle fibers is one reason why runners do long runs in practice—running beyond the 90 minutes or so where their muscles become glycogen-depleted. All my training programs offer long runs on the weekend with one purpose in mind: to make you a better endurance athlete.